The Draper 50x80" Salara Motorized Front Projection Screen is another cost-effective and cost-efficient option from Draper. 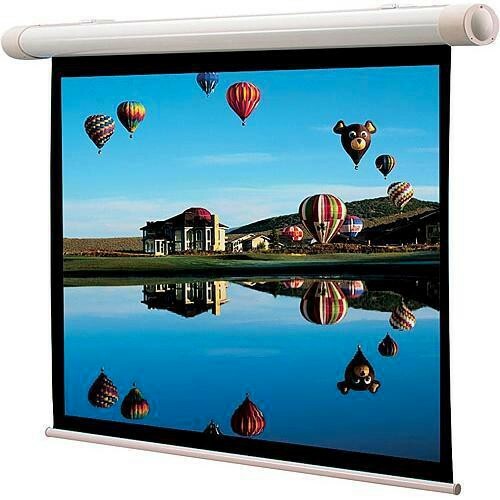 This small, reliable and stylish screen is a no-frills dependable screen for home or office use. Whether on the wall or ceiling, the Salara's design and reasonable price point make it a serious contender for purchase. The white extruded aluminum casing is held firmly by the gunlatch wall brackets. The brackets themselves are somewhat hidden giving the Salara more of a sleek appearance. This screen can be outfitted with any standard control option. Box Dimensions (LxWxH) 98.0 x 10.0 x 9.0"